We need to make better use of the data we have. Smart segmentation relies of great quality data. Perfect data is nirvana, but working with great quality data makes a huge difference to your campaigns. At the moment, we’re sending data to external 3rd parties to be segmented, this process costs thousands of dollars per campaign. Simple segmentation makes it easy for the marketing team to communicate with various audiences – customers, prospects etc. 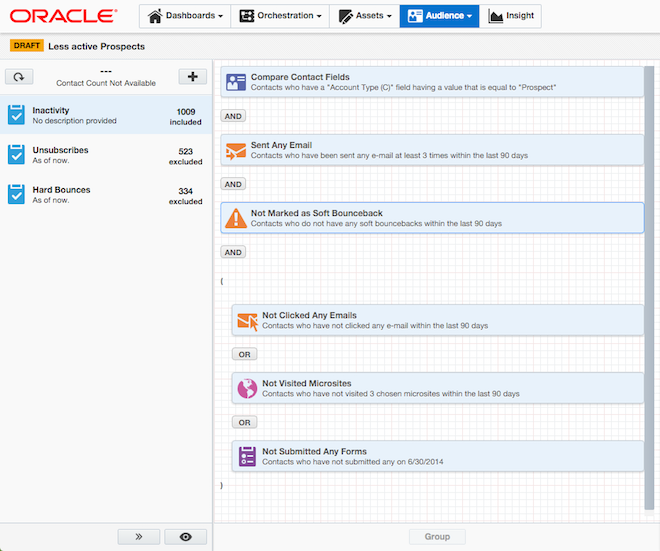 Eloqua’s sophisticated, yet elegantly simple to use Segmentation tool allows all segmentation to be done internally. The Eloqua Segmentation tool provides for simple inclusion and exclusion of data profile points. In this example, the marketer is looking to build a reactivation campaign. They’re looking not just at profile data, but also Digital Body Language™ as an indicator of inactivity. To help ensure the final number of contacts they reach are able to be emailed, it makes sense to exclude hard bounces and any global or subscription level unsubscribes.